The Collier-Crichlow-Smythe House at 511 East Main Street. I have thoroughly enjoyed touring the Collier-Crichlow-Smythe House twice in recent times. The interior of this majestic home on East Main Street is abounding in special treasures and wondrous collections. The rare antiques are beyond astonishing in the 18 rooms. This extraordinary Second Empire Victorian home is predicated on French architecture. The house has been on the National Register of Historic Places since 1973. The home was built in 1879 for $12,000 for owner Ingram Banks Collier III (1838-1879), who was also mayor (1872-1873) of Murfreesboro. W.C. Smith, Nashville architect, meticulously designed the home. Local carpenter H.C. Jackson was the builder of the home. 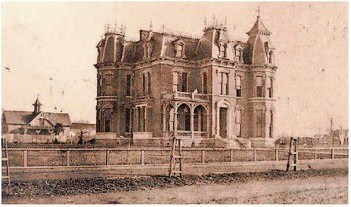 The Collier-Crichlow-Smythe House was built in 1879 for $12,000. The house is asymmetrical and showcases a mansard roof. The brackets, arched windows with heavy moldings, door and porch are based on Italianate style. Labor and materials of cut stone, tin ware, stone work and roof were provided primarily by Murfreesboro artisans. The house encompasses spacious rooms with a ceiling height (on the first floor) of 14 feet. The seven faux marble mantels and primary light fixtures are original to the house. The stippled woodwork is a classic detail in the home. Proprietor Ingram Collier III was born to Ingram and Martha Collier of Virginia and had 11 siblings. He was a cashier at First National Bank of Murfreesboro in 1869. He also worked as a cotton broker and farmer in the county. Collier built three cotton stores on North Maple Street. He held interest in the Collier and Ellington Furniture Store, Collier and Jones Grocery, and Exchange Mills in Murfreesboro. He also owned real estate in Rutherford county and in Mississippi. As Collier purchased shares of bank stock, as well as shares of the N& C Railway, he prospered. Collier wed a young Washington, Ky., widow Anna “Louisiana” Cushman Jones in 1869; and they had three children: Nama, Carmine and Ingram Collier IV. Their daughter Nama was gifted with a wonderful voice and performed at the Opera House in a lead role of “Beauty and the Beast.” Carmine created beautiful oil paintings and attended Soule College in Murfreesboro. Tragically, Nama died at 16 years old in 1886 of typhoid fever. Carmine, who never married, lived in the Collier home and was an ever-present hostess there for many years. She died in 1954 at age 83. Carmine lived with her mother until Anna perished in January 1924. Patriarch Ingram Collier commissioned the three-story mansion in 1878; yet, sorrow flooded the family with his death from leukemia in 1879. He is buried today at Evergreen Cemetery. With only the first floor completed, Anna and her children moved into the home. Yet, heartache continued with the death of their son Ingram IV, who died from diphtheria at age 6 in 1880. With unending peril at hand, Anna quietly lived with Carmine and her brother-in-law (Newton), along with his family, within the confines of the home. Ingram Collier’s will instructed the house to be finished. As time passed, a widowed Anna met Col. Horace Ready (1838-1904) at a social event; and a romance blossomed. He was the brother of Mattie Ready Morgan and son of prominent mayor and Murfreesboro lawyer Charles Ready. He also served as a colonel in the 23rd Tennessee Infantry Regiment of the Civil War. He was wounded at both Chickamauga in 1863 and at Petersburg, Va., in 1864. Col. Ready was present in 1865 at the surrender of Appomattox. He was a handsome man and hotel proprietor of Ready Hotel on East Main Street. Their marriage of April 13, 1888, brought new life to the Collier home, as the couple entertained in an endearing manner. They traveled together and refurnished the home quite splendidly. With the passing of Horace in 1904, Anna and her daughter Carmine lived in a portion of the house and were not as visible in the community. With lots sold, new houses were built nearby; and the grandeur of an earlier day subsided. Two decades following the passing of Horace, Anna died, and Carmine sold the home and moved to the Crichlow Apartments on Lytle Street. For 20 years, the house was empty. In 1948, Newton Crichlow, a Murfreesboro mayor, purchased the house from Carmine and lived with his family in the grand home for 37 years. The 8,000-square-foot Romantic Renaissance home is owned today by the Smythe family (1983), who have carefully preserved the edifice with fine historical restoration and graciously opened their lovely home to the community. The Collier-Crichlow-Smythe home is one of the most beautifully restored structures in Murfreesboro and continues to shine with loving care as a bright beacon for others to enjoy.